Gestalt was one of my mother’s favorite German words to throw into conversations. It means “the whole” or “all the things together” or, kind of, “the big picture”. Everything is everything. A couple of years ago, there was a dorky movie called the Butterfly Effect, which I didn’t watch because it starred Ashton Kutcher, and I’ll never see him as anything other than the idiot boyfriend of the oldest daughter in Cheaper by the Dozen. “They set me on FIRE!” The movie The Butterfly Effect was based on the idea that everything in the world is connected; a butterfly can flap its wings somewhere in Belize and it will affect events in St. Petersburg. Or something. Turns out that scientists at MIT have been studying the Butterfly Effect for a while, and the scientific world is now suddenly awash in data. While scientists are far from realizing the potential of all the data they’re receiving, this got me thinking. As a longtime member of the most dedicated (and, I suspect, the most superstitious) fans in sports history, Chicago Blackhawks fans, I have rituals that develop over the season that I follow before every game. My rituals don’t carry season to season; I’ve tried it, but each last-season ritual seems to turn into a recipe for making the Boys lose, so I stick with intra-season habits. My Blackhawks hat was sufficient during the 2013 winning season. My t-shirt/hat combo resulted in their 21-game point streak. My son announced yesterday that he stopped shaving during the last round against the Ducks. 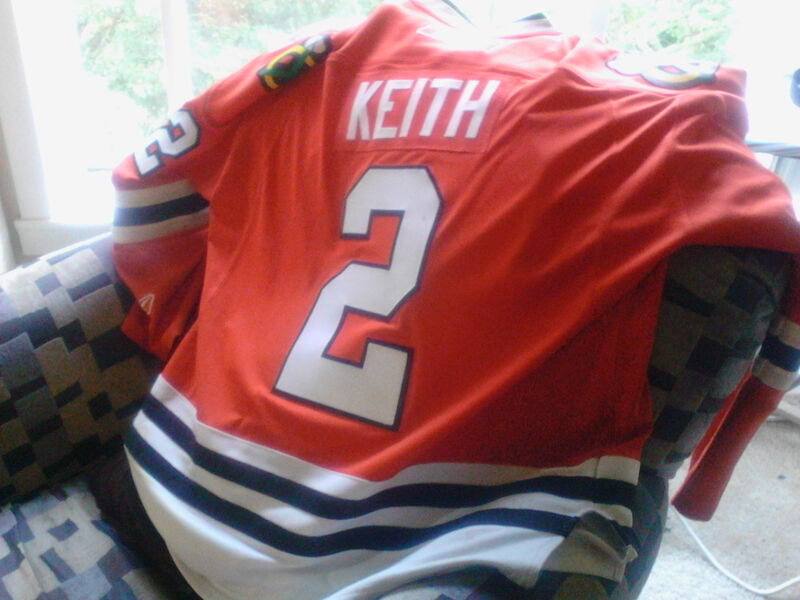 “It’s time for Neck Beard to make an appearance.” I’ll be wearing Tim’s Duncan Keith sweater to work tomorrow to send good juju to the Blackhawks as they start their series against Tampa. While on the one hand it seems silly, on the other hand, we don’t really know how things affect each other. There is energy in the world, a flow, a pull, connections between people and events that we can sense but we can’t parse. Scientists are starting to draw on the mountain of data that technology has afforded and are seriously considering the possibility that some little thing that happens in China might cause ripples touching the Caribbean. So I choose to believe we are all connected, that we can send goodwill out into the world and it can touch the people for whom we intend it. Even if it doesn’t directly deliver to them precisely what they hoped for, we can, on some level, affect a change. Maybe the only change will be in a single person who sees the jersey and smiles, remembering the time they lived in Chicago during the last Cup run. Or maybe the team will tack its collective effort to the wind of our encouragement and sail to victory. A sea of red jerseys in Chicagoland and around Illinois and all the way out to Portland can push encouragement to Tampa for our sports heroes to play well. It may be “only sports”, but the thrill of being part of the body of fans and players and organ-eye-zation at this level is pretty electric. It has given my family something to coalesce around, a reason to text and SnapChat and check in on Facebook about the crazy Shawzer goal or how we’re watching the game tomorrow. The five of us share a joyful energy about those 26 players: if just my family creates that kind of fervor, imagine the effect of two million fans. Scientists can’t yet prove whether butterflies affect the stock market or my jersey affects the Blackhawks. But they also can’t prove it doesn’t. You know what? If you enjoy it, go for it! I’ve been known to wear a pair of jeans for days on end, after an especially wonderful day – just because, dammit, the “good day jeans” mightn’t have worn off. And yeah — I LOVED the concept of The Butterfly Affect . . . the science behind the actual phenomenon is intriguing, and always catches me . . . .but, yeah, an Aston Kutcher movie? Pass.